What is the Graphical Toolbar? 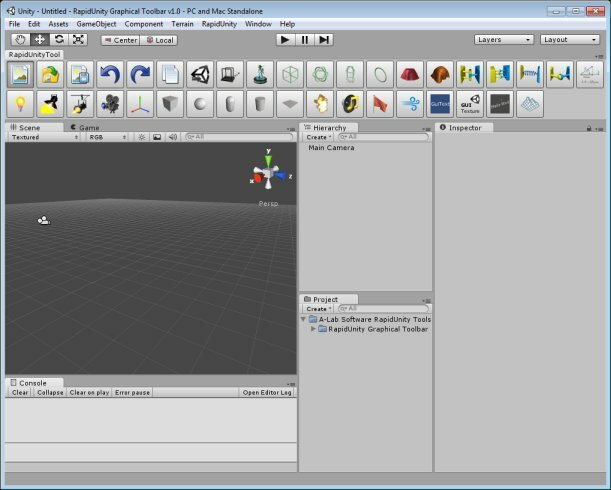 RapidUnity Graphical Toolbar is a Unity Editor panel that improves workflow within the Unity Editor. No longer use the standard menus and sub-menus, use the graphical toolbar buttons instead! Adding GameObject's is much quicker, add any of the standard primitives, or lights, camera etc, or add any of the components, such as rigidbody, colliders, cloths, hinges etc, by just clicking a button! Also available are New Scene, Open Scene, and Save Scene, along with Undo and Redo. The graphical images themselves should help you know what each button does, however if you simply hover the mouse over a button a tooltip is displayed telling you what the button does! The RapidUnity Graphical Toolbar is a great addition to the RapidUnity suite of tools, the essence of the RapidUnity concept is to speed up production, and using the Graphical Toolbar does just that! More information? Why not download the trial version! If you are considering purchasing the Rapidunity Graphical Toolbar, but your still not sure, why not download the trial version and learn more about the advantages of this great add-on to Unity. PLEASE NOTE: the following 17 buttons marked with a RED cross are disabled in the TRIAL VERSION, that still leaves 20 FULLY functional buttons for you to use! Get the Graphical Toolbar now!!! RapidUnity Graphical Toolbar is available for only £2.99 (approx $4.77/€3.39).